Serena Williams never feared defeat in her Wimbledon quarter-final with Camila Giorgi despite losing the first set on Tuesday. 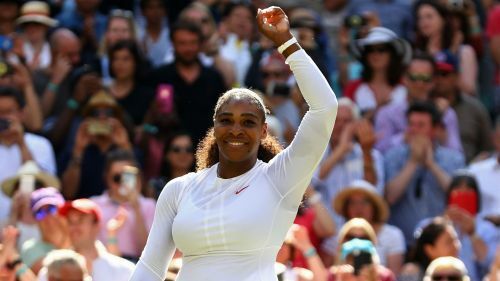 Williams surrendered a set for the first time during a tournament in which none of the top 10 seeds remain, making her favourite for an eighth All England Club title and a record-equalling 24th grand slam crown. She was in danger when Giorgi went 30-0 up on Williams' serve in the third game of the second set, but the Italian went on to fire a backhand long after an excellent return had seemingly put her in control of the rally, ultimately missing the chance to earn two break points. From there Williams took command and, as she has done so often in the past, pulled off a comeback to win 3-6 6-3 6-4 and set up a semi-final with Julia Goerges. Asked if she ever believed losing was a possibility, Williams told a media conference: "No. It's weird. Sometimes I feel, 'Man, I'm in trouble'. "Sometimes I feel, I can fight. For whatever reason, I was so calm. Even when I was down the first set, I thought, well, she's playing great. I'm doing a lot of the right things. It is what it is. "Just to be clear, that was just today. I mean, I'm hoping this is like a new thing. Honestly, I highly doubt it. It was just the way I felt today. I never felt it was out of my hands. It's weird. I can't describe it. I just felt calm. Hoping I can channel that all the time, but one day at a time." "I'm not tired at all. In fact, when I was out there, I think that was one thing that was surprising, was how well I felt," Williams added when asked if she was fatigued by her first match to go the distance. "Not once was I out of breath. Surely there wasn't a lot of long points, maybe that's why I wasn't out of breath. Felt good." On her contest with Goerges, who she beat in straight sets in the third round of the French Open, the 36-year-old said: "I played Julia in the French. That was four or five weeks ago. That doesn't matter. This is a whole new match, it's a new surface, it's everything. We're starting from zero."